Over at the madhouse on Washington Street, i.e., the Arizona legislature, they have been teasing the possibility of a budget deal all week. [T]he earliest budget bills could clear the Legislature and be sent to the governor’s desk for a signature is now Thursday. According to the Arizona Constitution, budget bills must be read in three calendar days. Budget proposal to be debated Thursday. Budget documents used to brief GOP lawmakers, obtained by the Arizona Capitol Times, reveal a tentative deal that gives Ducey much of what he asked for, including a host of new initiatives to boost K-12 funding, new school construction and maintenance dollars, and money for a two percent teacher pay raise over two years. It also appears that a deal struck that governor’s university bonding proposal, a sticking point, has ended the stalemate at the Capitol. The university bonding plan was pitched by the Arizona Board of Regents as a mechanism that would allow universities to keep the sales taxes they would ordinarily pay to the state, which they would then use to borrow up to $1 billion. In Fiscal Year 2018, the sales tax was estimated to be $30.3 million from the state’s share, and nearly $7 million from the cities and counties’ share. Critics of the plan, who included several GOP lawmakers, questioned how much the pot of sales tax money would grow each year, and worried about its impact on cities and counties. Instead, the negotiated budget starts with a direct appropriation of $27 million out of the state’s general fund, deferred by one year to Fiscal Year 2019. Three-year projections in the budget documents show that the annual appropriation for university bonding would grow over time. House Speaker J.D. Mesnard, R-Chandler, said the governor had acquiesced to the idea that diverting sales tax revenues to fund borrowing was politically unfeasible. Ducey had proposed a 0.4 percent teacher raise annually over the next five years, for a total of 2 percent. But after teachers and education advocacy groups panned the increase, the Legislature came up with its own plan to phase in the two percent raise in just two years instead, at a cost of $68 million. Budget documents also reveal new money for school construction and maintenance, an area that school officials have for years complained is woefully underfunded. Lawmakers are considering spending $62.9 million in Fiscal Year 2018 on new school construction, and another $38 million the following year, as well as $17.2 million in building renewal grants in fiscal 2018. Monday morning, a coalition of school officials filed a lawsuit to force the state to allocate more for school capital needs. The lawsuit contends that the state has failed to provide the money needed to ensure public school buildings, facilities and equipment meet minimum standards, and that failure has forced school districts to divert other resources to address those needs or allow them to persist. The Legislature also scored a victory with road funding. While Ducey’s proposed budget included no dollars for the Highway User Revenue Fund, which had suffered repeated cuts through the recession, budget documents show an ongoing $30 million appropriation for road maintenance. Lawmakers will take a sizable chunk of HURF monies back to their districts in this year’s budget, the documents show. The budget documents also detail new spending to cover the impact of Proposition 206, the voter-approved hike in the minimum wage to $10 per hour, on the Arizona Health Care Cost Containment System and the Department of Economic Security’s services for the developmentally disabled. DES would get a supplemental appropriation of $8.1 million in Fiscal Year 2017 and another $23.3 million in Fiscal Year 2018. AHCCCS would get $9.7 million in Fiscal Year 2018. Senate President Steve Yarbrough and House Speaker J.D. 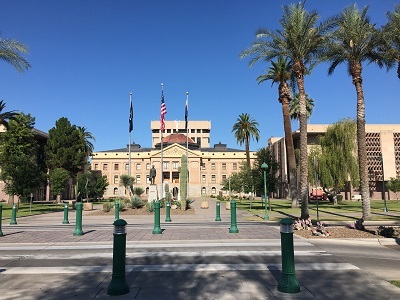 Mesnard confirmed that they lack enough Republican votes to approve the borrowing plan for Arizona’s public universities without help from members of the minority party. House and Senate Democrats are withholding their “yes” votes in hopes of making two amendments to the $9.8 billion budget deal reached by Republican leadership and the governor: A higher pay raise for K-12 public school teachers and a clean restoration of cash assistance eligibility for poor Arizona families. Democrats want a 4 percent pay raise for teachers over two years, as opposed to the 2 percent raise pushed by Republicans. And they want to restore lifetime limits on benefits through the federal Temporary Assistance for Needy Families program to 24 months, but without the strings attached in a bill back by Ducey and sponsored by Rep. Jeff Weninger, R-Chandler. Lawmakers had limited TANF eligibility last year to 12 months, the lowest in the nation. In a joint news release, House and Senate Democratic leaders claimed Ducey’s bonding plan will fail if he does not concede to their demands. So if the university bonding plan fails, what is “Plan B” for the GOP leadership on the budget? Republican legislative leaders are using a provision buried in the state budget in their latest attempt to defund Planned Parenthood. The measure requires the state Department of Health Services to apply to the federal government for Title X dollars. Those are family planning funds which now are given directly by the feds to health care agencies. As crafted, it requires health officials to argue that the state “is best suited to receive and distribute” these dollars to eligible agencies. But there’s something else in the measure: If the health department does get all the money, it cannot redistribute any to any family planning agency that also does abortions, even if none of those family planning dollars actually are used to terminate pregnancies. The move drew a sharp reaction from Bryan Howard, president of Planned Parenthood Arizona. Howard said the federal government has been providing Title X grants through a grant process since the 1970s. “Never in that entire time has this state government shown any interest in this family planning funding,” Howard said. The proposed state budget strips the Maricopa County Sheriff’s Office of $1.6 million in anti-gang and illegal immigration funding, and Republican Sen. John Kavanagh took no issue saying it was because of the Democratic sheriff’s immigration policies. 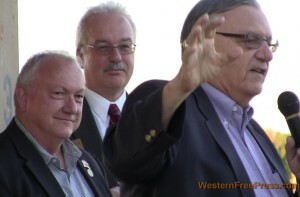 The Gang and Immigration Intelligence Team Enforcement Mission, or GIITEM, funding was earmarked for MCSO prior to Democratic Sheriff Paul Penzone’s win over his longtime Republican predecessor Joe Arpaio. But that allocation is being eliminated, with $1.2 million to be put toward a backlog of sexual assault kits and the remaining $400,000 for the Pima County Sheriff’s Office. If and when the budget is approved, there will be a rocket docket of bills that the GOP leadership wants to complete action on before sine die. This is when zombie bills you thought were dead are resurrected in the wee hours of the morning when no one is watching through a strike-everything amendment. It’s time to be on your toes, zombie hunters!